Upington is the second biggest town in the Northern Cape (after Kimberley) and is by many referred to as the 'Jewel of the North'. The small town which is located an 900km-drive to the north-east of Cape Town and a 900km-drive to the west of Johannesburg is the principal town in the region with a wide range of facilities. Upington is the capital of the 'Green Kalahari' region of the Northern Cape and borders Namibia and the Kgalagadi Transfrontier Park with its stunning arid landscape. 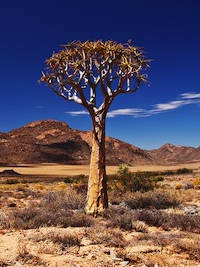 The beautiful quiver trees ('kokerboom' in Afrikaans) can be spotted everywhere as they grow well in the hot and dry climate of the Northern Cape. But the Northern Cape has not only arid regions, but also fertile lands due to the use of the Orange River irrigation system. The small towns of the 'Green Kalahari' region along the Orange River, South Africa's longest river, and the soft rolling hills along the riverbed provide proof of the fertile soils; and Northern Cape 'Orange River Cellars' with its headquarters in Upington are a co-operative of more than 900 wine producers in the region. The Orange River winelands with its wine farms, the awe-inspiring dune landscape around Witsand, the wildlife paradise of the Kgalagadi and the magnificent Augrabies Falls, 115 km to the west of Upington, are all within easy reach for a day trip from Upington. I have to admit going to Upington is certainly to far to go for a weekend trip from Cape Town, but if you have a long weekend such as the last weekend in April adding in the public holiday on the first of May, the trip up north is certainly worth all the driving. The trip is around 950 km from Cape Town and you have to plan in at least 10 to 11 hours for the drive. The Cape Town - Upington trip was easy as we were going up on the 'Cape to Namibia Route', the N7, passing Blouberg, Malmesbury, Citrusdal, Clanwilliam, all the way to Springbok and then finally turning east across the deserted countryside via the N14. The roads are good, occasionally there were some roadworks especially on the N7, where we had to stop several times at one-way road sections. In Kakamas, just after the turn to Augrabies Falls, as well as in Keimos, you will find little shops, so-called 'padstalls', which sell the delicious local raisins and dried fruit the region is well known for. The 'Pienk Padstall' in Kakamas is well worth a stop. They also have a small coffee shop and sell various baked goods and a variety of souvenirs there too. You cannot miss this place as the pink house and decorations are easy to spot. On the return trip we drove via the R27 leaving the town via Keimos then turning towards Kenhardt. There the road goes straight through the arid landscape, where you could see for miles and miles, passing through Kenhardt and the saltpans before Brandvlei. Our kids had counted only 17 cars in 30 minutes, at some streches the road was even less 'busy'. This road had more roadworks than the N14 and the R27 is not as wide as the N7 or N14, but the tarred surface is generally good. Further south, near Calvinia, the road takes you west back onto the N7 at Vanrynsdorp after admiring the stunning views from Van Rhyns Pass. This route is a bit shorter, only around 800 km, and takes approximately an hour less than going via Springbok. There are various accommodation options in Upington. From hotel accommodation, such as the Protea Hotel, which is situated in the middle of town at the Orange River, to numerous bed&breakfast places, many also situated along the river. We had booked to stay at the River Place Manor. 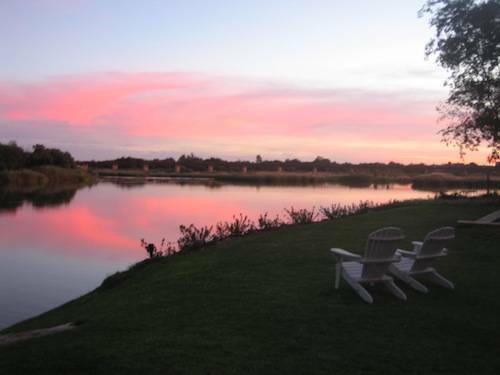 This guest house sits on the peaceful river as you can see in the image with the sunset over the Orange River. The guesthouse is really popular, so you need to book early. The River Place Manor's garden has a small pool to refresh after the long drive or a day out exploring. The landscaped gardens frame the view of the river beautifully and you can enjoy stunning pink sunset views as we did. The rooms were clean, spacious and modern and the service at this lovely guest house was good and efficient. 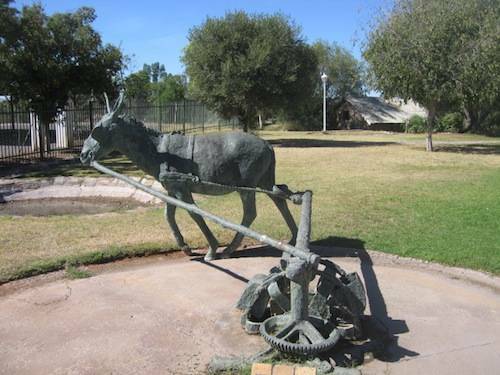 Explore the town and visit the Donkey Monument and the Orange River museum. The Mill Community Craft Center is offereing lovingly crafted artefacts and souvenirs to take home. Or take a walk along the Palm Avenue on the Kanon Eiland. Below a picture of the Donkey Monument which is located in the gardens of the town's museum. 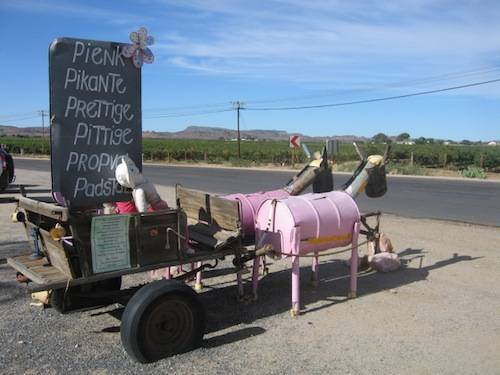 Take a Northern Cape vineyard tour. There are several boutique wine farms located along the river which offer wine tastings and cellar tours are also offered by Orange River Wines which is the biggest wine cooperation in South Africa; and the second biggest wine co-op in the world! We spent some time at Bezalel wine estate and enjoyed learning more about wine and port making in South Africa. 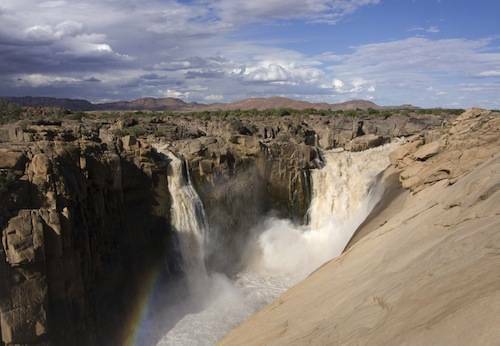 Visit Augrabies Falls and its thundering waterfalls which are the second highest in South Africa. The Augrabies Falls National Park is great for walks or nature drives. Some parts of the park can only be explored with a 4x4, but you can also book a tour at the visitor center. The walk along the well laid-out wooden pathway from the visitor center lets you view the gigantic falls in all their magic. The nearby villages such as Keimos and Kakamas offer farmstalls (padstall) where you can buy the freshest dried fruit, mainly raisins and sultanas, and also other delicacies like organic teas, fresh homemake cookies or nougat to take home. Canoeing and Watersports can be done from various guesthouses. Some of them have jetties should you take your canoe and some do rent out their jetskis or canoes or offer waterski lessons. Guided canoe trips on the Orange river are very popular and should be booked ahead. More attractions and information about the region here. School and Education: There are various good public schools in the area, primary as well as secondary schools in town are good and offer lots of activities for kids who love sports as well. There is a technicon offering further studies, but most high school leavers go to universities in South Africa's major cities. Medical Care: There are several good doctors and clinics in town. The town has two hospitals, the public Gordonia hospital and the private Medi-Clinic. Housing: Housing Prices are on the rise as several big projects are coming up in the area and upmarket homes are sought after. There are many good housing areas which are safe. There are actually not many high fences and people still are more relaxed and feel safe without being walled in. Safety: is considered good and the whole region is said to be one of the safest in South Africa. Policing seems to be very efficient. Transport: The road infrastructure linking major towns is good. There is a trainstation, bus interchange as well as an airport operated by ACSA connecting the Green Kalahari will all other regions in South Africa. A new regional airline, Phalakane Airways, has just began operating in the province. The airport is located some 5kms outside of town and has actually the longest runway in South Africa but there are only domestic flights serviced. There are several petrol stations and garages. Spare parts and car traders have good facilities in town. Shopping: The major chain stores Games, Musica, Pick n Pay, Checkers and Woolworths have shops in the town centre and the new mall. Many boutiques, smaller traders and other well known South African chain stores can be found. The Kalahari Mall with more than 70 stores on the outskirts of the town is now open and attracts visitors and shoppers from near and far. Eating out and Nightlife: There are numerous coffee shops and restaurants, a cinema, several bars, and even a casino in town. Our personal favorite restaurant when eating out was Bi-Lo, a local supermarket and restaurant with a huge orange sign you can't miss on the N14 just at the Eastern entrance of town. They have delicious food, good service and the athmosphere is special. Kids Playground and springboks in the adjacent park to watch from your outside table. For fans of irish pub food there is O'Haggans in Schroeder Street. The usual South African fast food outlets and restaurants such as Wimpy, Steers, Dros and KFC are easy to find in the city center. We hope you enjoyed our information about this lovely town. How about visiting one day? If you want to share your experiences, let us know and contact us.